This week on the WELSTech Podcast Gail Potratz joins the discussion as we look at summer professional development opportunities. Make a Plan – As the school year wraps up Gail Potratz, the WELSTech semi-regular classroom technology correspondent from Emanuel in New London, WI, joins Martin and Sallie to discuss ideas for summer enrichment, professional growth and even a little relaxation. Kevin Smith from Christ in Zumbrota, MN pointed us to info on Microsoft Multipoint Server. He learned of this from the Windows Weekly TWiT Podcast. This week the WELSTech Podcast round table welcomes Apple “Geniuses” Bob Martens and Aaron Spriggs. A bite of the Apple – Bob Martens and Aaron Spriggs, true Apple fan-boys, cozy up to the podcast microphone to chat with Martin and Sallie about the variety of products available from Apple and the many uses Apple products have in schools and churches. 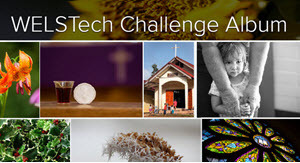 (43:35) Pastor Phil Huebner from Christ the King in Palm Coast, FL gave us a tech update. In just their 4th year of existence, Christ the King is an all Mac campus (anticipating 200 students next year) using Snap Grades for online grade management, posting sermon archives on Vimeo and considering adding live streaming of their services soon. Join the WELSTech-er efforts to promote the hashtag “callday” on Twitter this week as WELS live streams graduation events from Wisconsin Lutheran Seminary. 183 – Security and Privacy and Fair Use, Oh My! This week on the WELSTech Podcast we finish our current book discussion and chat with Greg Boggs about school privacy solutions. It’s a wrap! – Martin and Sallie finish up their discussion of the current book selection, Leading 21st Century Schools by Lynne Schrum and Barbara B. Levin, with a look at chapters 8 and 9 of the book. Topics include privacy, acceptable use policies, web site evaluation and the digital divide. (21:45) Ask the expert – Greg Boggs, a member of St. Mark in Lincoln, NE, joins Martin and Sallie to share his experience with school network content filtering as well as wireless security concerns. (57:00) Joanne Nemmers, school secretary at Calvary in Dallas, TX, is looking for After-School Care management software. We suggested the open source solution, PHP Timeclock. Do you have a recommendation? Jonathan Favorite, staff minister at Crosswalk in Phoenix, AZ, suggested WELSTech model LifeHacker’s content delivery approach. Martin shared a promo video for the new CPH graphic novel, Echoes of the Hammer. Jason Schmidt, teacher at Gethsemane in Omaha, NE, shared a link to Haiku LMS (Learning Management System). https://welstech.wels.net/wp-content/uploads/2017/06/000welsTechLogoEnfoldnew.png 0 0 Sallie Draper https://welstech.wels.net/wp-content/uploads/2017/06/000welsTechLogoEnfoldnew.png Sallie Draper2011-05-11 05:00:092018-02-13 12:32:41183 - Security and Privacy and Fair Use, Oh My! This week on the WELSTech Podcast we share the tech talk from last week’s 2011 WELS Conference of Staff Ministers. Lots of intersections – Martin and Sallie recap the recent Staff Minister Conference and the various discussions they led for the multi-talented, multi-vocational audience. It’s neat to see how technology is a thread which crosses the variety of ministry paths in which Staff Ministers are involved. (23:54) Greg Mink from Peace in Eagle River, AK shared “No Fear!” sermon promo videos created by Pastor Rob Guenther at Grace in Kenai, AK using Xtranormal.com. Check out Pastor Guenther’s YouTube channel for lots more examples. Perry Lund from Grace in Oskaloosa, IA pointed us to the online embeddable book 125 years 125 Stories Martin Luther College. Have you tried the Boogie Board Paperless LCD Writing Tablet? Let us know what you think of it. May is Digital Outreach Month. Check out the resources at InternetEvangelismDay.com and listen to our archived podcast interview with IE Day founder Tony Whittaker.